After a week in Accra I was moved to a village called Agbesia in Volta region, where I joined other volunteers from OSDA. They all come from Germany and they are supporting teachers in local junior high school and senior high school. They teach ICT (information and communications technology), however the schools are lacking computers and there is often a power blackout. It is extremely difficult to explain students how to send an e-mail or create a text document without using an actual computer. Moreover, pupils are also missing text books, for example in one class with 30 students there are only 4 text books available. The Ghanaian teachers are still using canes as a form of physical punishment. The typical school day starts at 8.00 am and finishes at 2.00 pm with an hour long lunch break. Students wear uniforms, which were purchased by OSDA and the organization plans to raise money for the footwear as well. Although there is still so much work to do, volunteers are trying their best to improve conditions and the level of education in Agbesia. One of the volunteers is positioned in a local health clinic, where she works together with the medical staff. The major health issue is malaria, which is responsible for the most cases of hospitalization in Ghana. Malaria test kits are available in clinics and pharmacies. The test helps to indicate if you are positive or negative in less then 15 minutes. The health clinic I work for is located in Have, which is a small town near Agbesia. My duties involve dispensing of prescribed medications, counseling patients and assisting the other medical staff. The clinic is very busy, providing care for 50 to 100 patients a day. I will mention more about my work in a different post. In my opinion, the village seems like a much nicer and healthier place to stay comparing to Accra. There is less garbage in the streets, lots of fresh fruits and vegetables from local farms and very friendly atmosphere. Agbesia is surrounded by farms and rainforests and the major attraction is Aflabo waterfall. Me and other volunteers went to see the waterfall and it was amazing. The pathway to the waterfall leads through the rainforest and through the small caves. It requires good hiking shoes but our friend from local village went barefoot. When we came back from the trip village people cared to mention that the local forest is full of poisonous snakes and their bite can kill within 3 minutes. Good to know! Agbesia primary school and kindergarten. The villagers in Agbesia live in modest conditions. 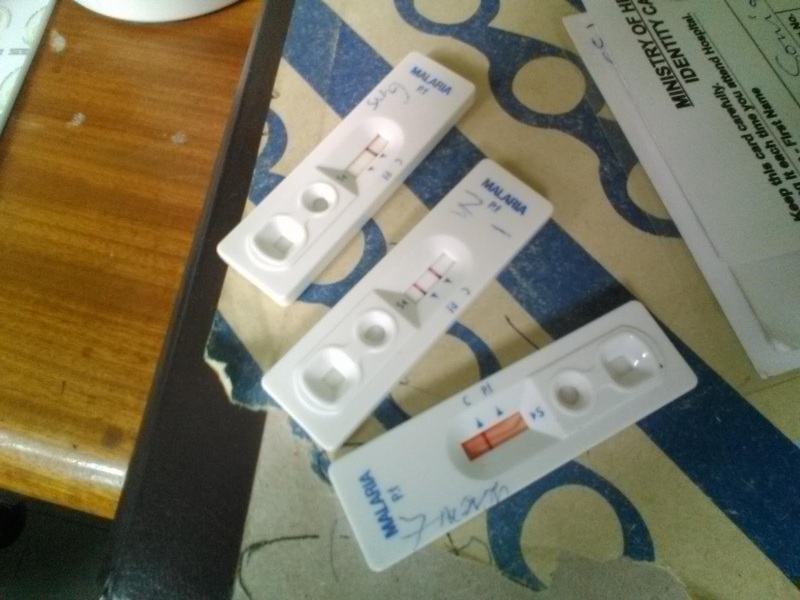 Two stripes in the test indicate malaria, one strip means negative result.